I went to pick up my kids tonight after work, leaving the office and getting on the freeway with the onset of a headache. It had been a long day, and to be honest, I was not looking forward to the ordeal of cooking dinner, getting homework done, showers taken, lunches made for tomorrow… I wanted nothing more than to just go home and lie down and make the headache go away. I pulled into the driveway of their mom’s house, and cut the engine. I took a deep breath, let it out in a long rush, my head bowed and my eyes closed, hoping that this was not the start of a migraine. I said a quick prayer for patience and willingness. I opened the car door and stepped out. As I turned to walk toward the porch, I stopped in my tracks. A completely unexpected smile started to form on my face as my weary brain began to register what it was I was looking at. My fatigue was gone in an instant as I took in the vision before me. My seven-year-old daughter, Makena, was strolling down the driveway toward me. She wore a bright orange pareo – knotted around her neck so it flowed behind her – as a cape. Beneath it she wore a blue t-shirt with little yellow chicks shown beneath the words “Hanging With My Peeps”. She wasn’t wearing any pants, but instead wore a pair of her brother’s underwear briefs. And on her feet: a pair of brown suede pumps – her mother’s shoes, several sizes too big for her little feet. She walked like a newborn colt or a barfly at closing time: unsteadily, shakily, but with utter pride. The look on her face was a combination of intent focus (on walking in heels), utter glee (in her outrageous attire), and pure delight (to see me). I could not help but laugh out loud with the same glee and delight. I met her halfway across the driveway and gave her a big hug, and asked her with a chuckle, “Makie, where are your pants?” to which she calmly replied, “In my room.” Question asked and answered. “Go get your brother,” I said, and off she went, her cape flowing behind her like capes are meant to. I noticed she was already getting the hang of the heel-toe, heel-toe, heel-toe method of walking in those shoes. They grow up so fast. Minutes later, she came back out, the cape and pumps gone, replaced by grey sweatpants and no shoes. She and Hayden both loaded their backpacks in the back of the car. Hayden was the first to cry, “I call D.J. !”, which meant that he got to control the iPod on the drive. It also meant that Makena got to ride “Shotgun!”, because that is the fair trade: whoever gets to be D.J., the other one gets to ride shotgun. I don’t remember exactly when that treaty was brokered, but it tends to keep the peace so I don’t mess with it. On the drive to my place, as Cee Lo Green was singing the very family-unfriendly but unbelievably catchy song “F**k You”, I reduced the volume, turned to Makena and asked her something. “Makena, when you came outside dressed in the cape, who were you supposed to be?” I asked. I turned the music up and we drove along, going from the funky refrains of “the F.U. song” to the disco beats of Lady Gaga admonishing her boyfriend for telephoning her while she’s at the club. Jack Johnson followed shortly thereafter, and eventually there was some Sia thrown in – Hayden is a very versatile D.J. I realized after five or six songs – my headache was gone. As we drove, I thought about Makena’s comment, and my heart swelled up with love. The kid marches to the beat of her own drum, and that is so awesome. I was reminded of an assignment she’d done while in Kindergarten two years before. We were at Open House Night near the end of the school year, and I was walking around her classroom, looking at all the art work and papers posted on the walls by all the students. 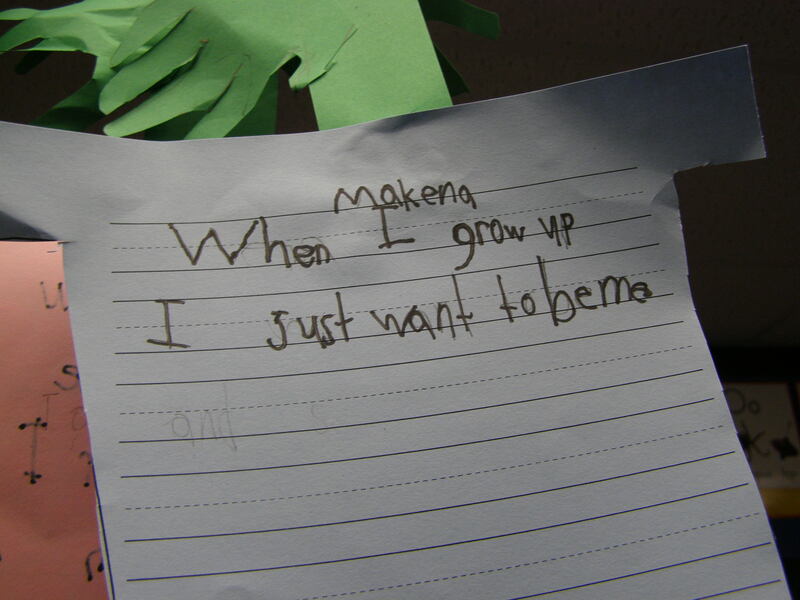 One of the assignments was to write “What I Want to Be When I Grow Up.” I looked for Makena’s paper, and when I found it, I had that same feeling of my heart swelling with love for my little girl. Her answer was so beautiful, so simple, so honest. “When I grow up, I just want to be me”, the paper read. I wrote at the time that I hoped her answer would never, ever change. I am so happy to see that, two years later, it hasn’t. This entry was posted in Family & Kids and tagged costume, daughters, dress-up, individuality, little girls, pareos, super hero by Terry G Parker. Bookmark the permalink. Terry, on so many levels, you have got to be one of the coolest, most wonderful dads ever. Just doin’ my job, Larry. Thanks for reading. This is both priceless and beautiful Terry. Enjoy every minute of their childhood, I find with Spence being seventeen now, it all goes so quickly! Thanks Michele. I am enjoying every minute of it.